Palladium Books® and Ninja Division (the creative minds behind Soda Pop Miniatures and Cipher Studios, makers of Super Dungeon™ Explore, Relic Knights™, Helldorado™ and Anima Tactics™) are proud to announce the launch of the Robotech® RPG Tactics™ Kickstarter. Robotech® RPG Tactics™ brings you an array of beautifully sculpted Robotech® game pieces, suitable for collecting, in a fast-paced, strategy battle game that brings the epic combat of Robotech® to your tabletop. Take command of the fighting forces of the United Earth Defense Force (UEDF) valiantly defending Earth from alien annihilation. Or lead the massive clone armies of the Zentraedi Armada to recover an alien artifact of immense power and enslave humankind. Relive the massive battles on your tabletop, engage in stand-alone tactical games or use the dynamic game pieces to enhance your Robotech® RPG experience. Collect your favorite mecha from an expanding range of world-class game pieces. Whether you are familiar with Robotech® or not, this game is fun. The Robotech® RPG Tactics™ Kickstarter helps Palladium to fund the launch of a compelling and expanding game line designed specifically for Robotech® fans and gamers. Six months of product development has produced nearly two dozen gorgeous sculptures (with more to come), a mountain of artwork, and game rules that have been play-tested by more than 100 Robotech fans and gamers to ensure we make Robotech® RPG Tactics™ everything you could want. Once the Kickstarter reaches our funding goal, we have a host of fantastic upgrades, additional game pieces and new unit add-ons to unlock! Every Destroid. More Zentraedi mecha. More fun! And because so much is DONE, this project should go into manufacturing within 45 days after the Kickstarter! That’s fast. This is just the beginning. Palladium Books plans to bring you the mecha and adventure of each and every era of Robotech®. And you have the chance to get in on the ground floor. Your support of this Kickstarter is vital to the successful funding of this massive undertaking. Please take a look and consider supporting us. Also please spread the word and help us create some excitement. Thank you so much for your time, consideration and support. 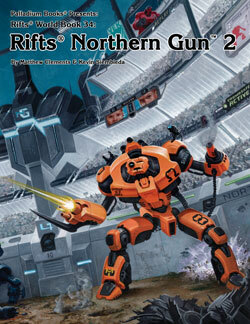 Ever consider playing the Robotech® role-playing game? This is the time to check it out. To introduce even more gamers to Robotech®, Palladium will be offering ALL Robotech® role-playing game titles at a 20% discount. This is a limited time sale for the next few weeks only. Each Robotech® RPG book contains a wealth of information, artwork and sometimes never-before-revealed stats and information about the mecha, vehicles, weapons, characters and settings you love. The four core books – Robotech® The Shadow Chronicles® Role-Playing Game, the Macross Saga™ Sourcebook, the Masters Saga™ and New Generation™ – are worth owning just to have the reference they provide, even if you never play the game. An inexpensive way to try a new setting, and all titles are available now. Needless to say, the big news this week is the launch of the Robotech® RPG Tactics™ Kickstarter. As such, it is the focus of this Update. We are extremely excited about it and hope you are too. Meanwhile, we have all been working away on various projects with most of our focus on the Robotech® RPG Tactics™ Kickstarter, The Rifter® #62 and Northern Gun™ 1 & 2. Chuck Walton continues to come to the Palladium offices to work on the NG art, and the contributions of all other artists are finished. 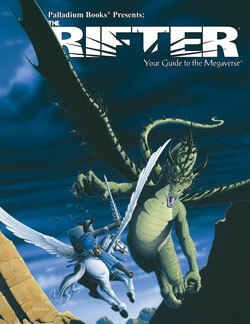 The Rifter #62 is epic, and the feedback coming in about Rifts® Vampires Sourcebook show people are raving about it. Like I keep saying, creatively, we are on fire right now, and the books coming out are all going to blow you away, one after the other. Go to the Kickstarter and see for yourself. You’ll like it. Robotech® RPG Tactics™ Boxed Game Highlights. 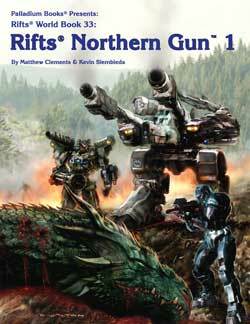 Full color, 90+ page, softcover rulebook. 1/285th scale, high quality, multi-pose plastic game pieces. Most pieces range from 40-70mm tall. And once the Kickstarter reaches our funding goal, you’ll have the opportunity to acquire a range of additional game pieces and upgrades. Kickstarter exclusive prints! We thought it would be a nice gesture for Palladium role-players to offer a couple of print sets. One features the never-before-seen full wraparound cover painting for the original Robotech® RPG cover (1986) and the wraparound cover of the RDF Manual (1987). Each is 17 x 11 inches and signed by Kevin Siembieda. The other set contains five, 8½ x 11 inch prints from various Robotech RPG titles from the 1990s and represent the Three Robotech Wars; plus a Certificate of Authenticity, signed and numbered by Kevin Siembieda. It brought back a lot of memories for us, and it seemed appropriate to have a little bit of history in this exciting new era of Robotech® gaming. 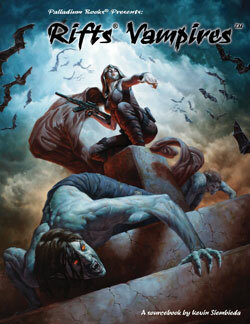 Rifts® Vampires Sourcebook™ is a hit. Gamers are going wild over it just as we hoped. You can get a peek at the contents and some material in the FREE Sneak Preview available on DriveThruRPG.com. I am so pleased that everyone is enjoying the book so much. Every contributor rocked this book. O.C.C.s include the Mage Vampire Hunters, D-Bee Vampire Hunters, Bandit Vampire Hunters, and other slayers of the undead. This issue of The Rifter® is truly going to be spectacular, with as many as 48 pages of “official” source material for Rifts® (20 pages of “official” Rifts® Vampires source material, new Necromancy spells, a Northern Gun mech, and the missing Rifts® Black Market experience tables! ), plus detailed castle floor plans and descriptions that can be dropped into any Palladium Fantasy® campaign anywhere you need one, plus some epic Heroes Unlimited source material I may expand into a complete sourcebook in the future, news and information. Rifts® – OFFICIAL Necromancy and Bone Magic spells. What else is there to say other than more magic and darkness for your Necromancers (and the African Witch). 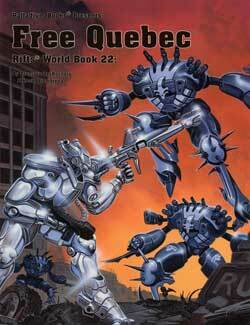 Heroes Unlimited™ source material for making your heroes international police. It is an idea that Kevin Siembieda thought was so perfect for a setting with superhumans that he is thinking about expanding this material into an entire sourcebook. More Palladium news and updates next week. Game on and enjoy Palladium’s very first Kickstarter funding campaign. Rifts®, The Rifter®, RECON®, Splicers®, Palladium Books®, The Palladium Fantasy Role-Playing Game®, Phase World®, Nightbane®, Megaverse®, The Mechanoids®, The Mechanoid Invasion®, Coalition Wars® and After the Bomb® are Registered Trademarks of Palladium Books Inc. RPG Tactics™, Beyond the Supernatural, Chaos Earth, Coalition States, Dead Reign, Heroes Unlimited, Ninjas & Superspies, Minion War, Mysteries of Magic, SAMAS, Thundercloud Galaxy, Three Galaxies, Vampire Kingdoms, and other published book titles, names, slogans and likenesses are trademarks of Palladium Books Inc. and Kevin Siembieda.